In living memory, a complimentary drink is something that we have treated as a given on flights. In the current era of budget airlines, however, this has apparently changed, as Gene Goh discovered. According to a Facebook post, Goh was on a flight from Singapore to Osaka with Scoot, a budget airline owned by Singapore Airlines, when he asked for a cup of water. The flight attendant answered that bottled water was available only if he bought it. Singapore Airlines has often been named the best airline in the world, yet ironically, its budget subsidiary won’t even provide the most basic human necessity free of charge for its clients. That is, not in its liquid form. 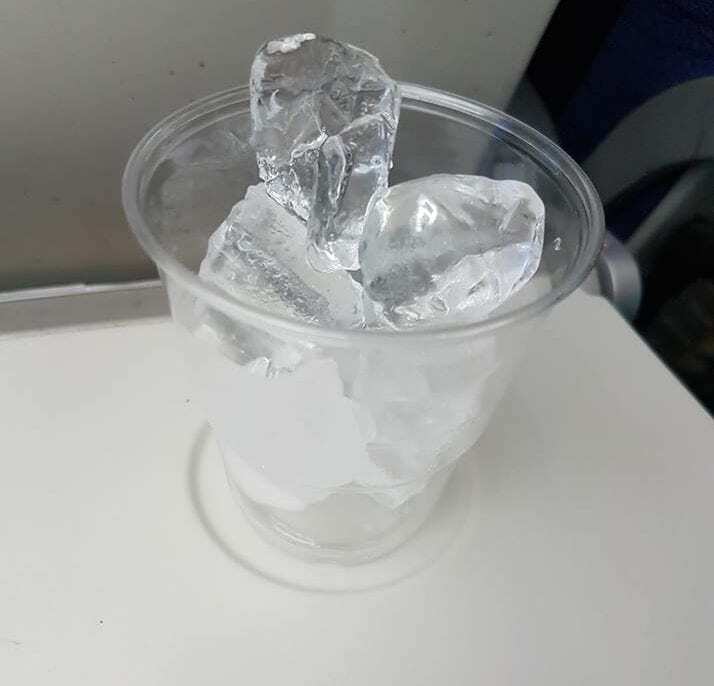 To accommodate Goh, the flight attendant gave him a cup of ice and told him to wait for it to melt. While ice is indeed water in a solid state, the fact that it needs time to revert to a liquid means that Goh would have to wait time. 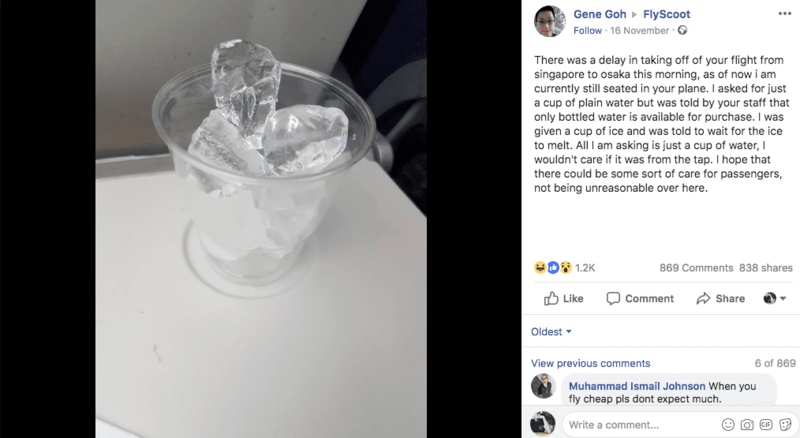 Dehydration is a serious concern on flights, and as Goh’s was delayed, it seems unreasonable to expect him to have to either cough up cash or wait an unknown amount of time before having water available again. If the flight attendant had simply given him tap water, however, it may not have ended well. According to the Environmental Protection Agency, one of eight planes doesn’t meet water safety standards. Internet users voiced support for him as well as criticism. Some users called him cheap. Furthermore, according to a flight attendant who spoke to Business Insider, regular tap water might actually be the worst thing you can order on a plane; a study by the Environmental Protection Agency found that one in every eight planes fails the standards for water safety.